Robert was born on October 31, 1933 in Ridgeville, MD and recently celebrated his 80th birthday! Robert’s family moved to Ellicott City when he was very young. He attended public school for a few years at West Friendship Elementary, which is now his polling place. Robert left school at a young age to go to work to help support his family. He is very connected in his community, with many friends throughout Ellicott City and Howard County. Robert still lives in the same house he grew up in, sharing his home with Precious, his beloved cat. Robert began receiving Individual Support Services from The Arc in 1994. His brother, Charles, also receives services from The Arc. Robert is a valued member of his Ellicott City community, which is evident when he enters his favorite restaurant, his church, the barber shop, drycleaners, etc. At age 80, Robert still enjoys his part-time job at McDonalds two days per week! In addition to work, Robert attends a local senior center two days per week and spends time with his staff from The Arc, who assist him with household tasks and responsibilities, errands, going to the bank, shopping and doctor’s appointments. Robert is a very active member of his church and he regularly attends services on Sundays and Bible study on Wednesdays. Robert also has some extraordinary friends in his life! He loves celebrating his birthday every year by having lunch with people that are special to him. He always joins in when we sing “Happy Birthday” and is proud to be surrounded by friends. Over the past year Robert expressed to his close friend, Charlie, that he would like to visit his parents’ grave site. He remembered that they were buried in Sykesville, but was not sure where. After doing some research, Charlie located the cemetery where Robert’s parents are buried. 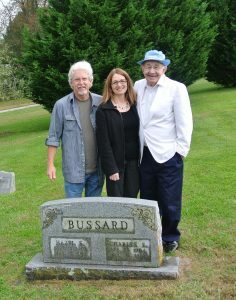 On October 23, 2013, Robert was able to visit the cemetery to see his parents’ grave stone, his grandparents’ grave stone and also his uncle’s. According to an old (and fragile) document hanging in the small church’s office, Robert and his brother, Charles, both have cemetery plots next to their parents. For Robert, visiting the gravesite was something special and also brought closure to a yearlong search. As Robert looks forward to another year of a very full life, you may see him dancing the night away at The Arc’s Holiday Party, having a great time at The Arc’s annual summer picnic at Centennial Park or just out and about in Howard County! His friend Charlie makes arrangements every year for Robert to vacation in Ocean City so you may possibly catch a glimpse of Robert on the OC boardwalk taking in the sights! You can’t miss his smile that warms the hearts of everyone he meets.